In a recent note, Morgan Stanley which recently has become arguably the most bearish of the big banks, said it had lowered its US equity allocation to +0%, noting that it was "removing a positive bias to US equities that has existed since April 2017. As justification it cited the recent strength in US equities which "now means outright downside to Morgan Stanley's 12-month price target" and notes that "while our cycle models remain in 'expansion', a phase that has historically seen valuation overshoots, we are increasingly concerned that the bulk of this tailwind is already behind us." As a result, the bank no longer recommends any US equity exposure above an investor's benchmark. The bank, which two months ago downgraded the tech sector to Sell - a recommendation that has had mixed results at best - goes on to note that while its US equity strategists forecast strong returns last year, expectations for this year have been far more limited, driven in part by concerns that peak EPS growth is now behind us (Exhibit 4), and more recently by defensive leadership (Exhibit 5). Picking up on a point we made one week ago, the bank also notes that recent US equity strength is also unusually extended versus ex-US equities (Exhibit 6) and other risk assets (Exhibit 7). Invoking the "rolling bear market" model proposed some time ago by its chief equity strategist Michael Wilson, Morgan Stanley writes that US outperformance has been an ongoing theme in recent years, "but even by these halcyon standards, US equity strength in the face of weakness in credit, emerging markets, Italy and copper prices (to name a few) is notable." More importantly, looking ahead the bank cautions that it is growing mindful that the next 2-3 months are heavy with potentially market-moving events. Below is a partial list of risk events waiting for investors as they come back from summer holidays. "While something always lies ahead for markets, this slate is material, especially in the face of recent outperformance." A turn in our cycle indicators would dramatically lower the expected return for all equity markets in our framework. Such a turn would likely need worsening labour markets and consumer confidence. A short-lived turn in these models was a reason why we reduced exposure sharply in November 2015, and kept it low (for too long) through October 2016. Higher real rates/tighter financial conditions: Higher US real rates, absent a pick-up in growth/productivity, would directly compress equity risk premiums for US and EM equities, while higher rates in Japan would likely strengthen JPY, creating a problem for Japanese stocks. We think that Europe is the market with the most real rate 'cushion' relative to the last 10 years, one reason why it's at the top of our global pecking order. Higher real rates would also boost the case for allocating into bonds. Signs of a larger margin/EPS growth peak: Our equity strategists see the case for this growing. We expect 3Q18 to be the peak in EPS growth for US stocks, and while the market expects some deceleration next year as we lap tax, we think that the deceleration is likely greater than expected due to tough organic comps, already elevated margins and rising costs. We are materially below-consensus for EPS in Japan and EM. Again, we see risks in Europe as somewhat lower. Putting this all together, the bank which recently overtook Goldman Sachs in terms of revenue thinks that it is more likely that it will reduce risk exposure, rather than raise it, over the next 3-6 months. 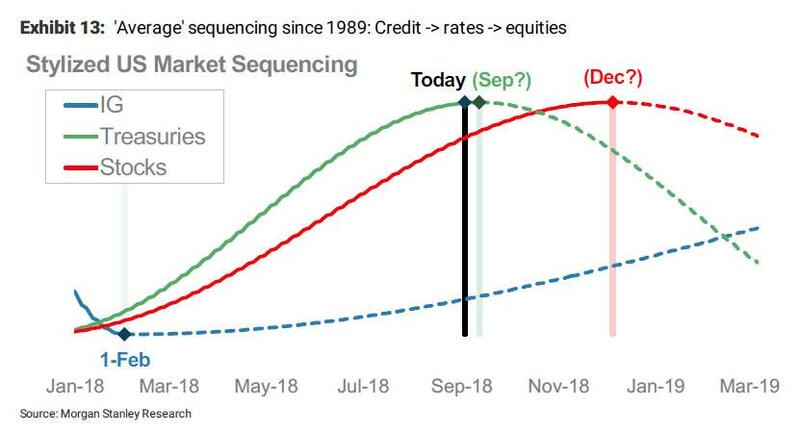 And here is the (calendar) punchline: if credit spreads made a cycle trough in early February - as Morgan Stanley assumes - the average equity peak has come ten months later - which would be December - while yields have historically peaked seven months later, or right about now, in September. In conclusion, while the bank's strategists don't urge their clients to sell outright - at least not yet - as "the history here is both limited and variable", it ends by saying that it doesn't expect "to stay for the very last song at the party."